Residents in a Devon city are being invited to go to an exhibition outlining design proposals for a 'new look' high street. The £1.7m scheme for Exeter is being put forward by the city and county councils, as well as developer Land Securities, which is behind a project for Princesshay. The exhibition is being held at Lloyds Bank in Bedford Street and is part of a consultation exercise by the two councils. But the plans have angered protest group Exeter Peoples Choice, who have campaigned against the proposed redevelopment of nearby Princesshay. That scheme involves the building of 50 new shops and restaurants. The group believes the timing of the project to revamp the city's High Street is wrong. Group spokeswoman Catherine Adcock said it was senseless to start work on the High Street, before Princesshay had even been pulled down. "We again find great disbelief in all this," she said. "To do something to the High Street - when the redevelopment of Princesshay will have possibly already started - which is so major it will close it and cause chaos is unbelievable." 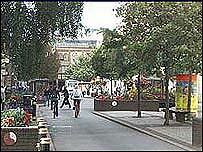 City centre manager John Harvey said an avenue of trees, new seating and high quality paving would enhance the area. "It will make a big improvement in terms of a setting for business," he said. "The setting in Queen Street is much better now that the work there is completed. "It is a much better environment for shoppers and visitors."